Events on the other side of Kashmir have taken a turn for the worse in these past few weeks...An utter understatement if one ever existed. Hereby is a link to my humble submission on countercurrents.org. This was written on the 7th of August (07/08/2008) and published on countercurrents.org on the 8th. I'm also grateful to 'Kashmir Times' - an English daily in Jammu - who printed the article in their 16th of August edition. Note: Apologies for putting this content in advance of it's timeline. This aberration should be a one-off because it is too late to be reversed. How did your Nani happen to marry your Nana? Also, can you not get her to Video talk to her siblings in India till she can physically visit them? I pray for her health and long life. "Stifling the Spirit: my Nani and 61 years of Anguish", at 13 years of age, with a hand on my heart, I most humbly Pray to Almighty for the reunion of Tanveer 's Nani with her Family. i am a student of class 8th and was very moved after reading your article. I read your article, it was very moving. In sha Allah someone somewhere will be able to speeden up the process. As for me, I'll keep making du'aa. Very fine article by you in Today's Hindu about your naani. Your article in The Hindu dated 18th made me sad. 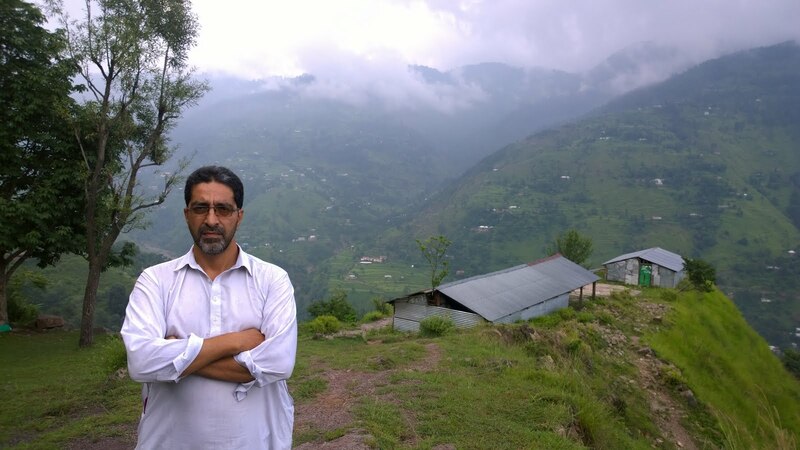 I hope you will be able to take your Naana and Naani to this side of the LOC very soon to meet your relatives. I am writing this note from Trivandrum, the capital of Kerala in South India. I also happen to have some very distant relatives in Karachi, some of whom I have never met. Anyway I wish you good luck. I was emotionally moved by reading ur article in The Hindu dated July 18th 2008.It was almost like some scenes of the movie Gadar in front of my eyes except some age and relationship differences and of course in this case, a woman who has her roots in India or United India (before independence) whatever u may like to call. While I can understand your nana's fears that your naani may not return once she mingles with her relatives, I appreciate your endeavour in uniting her with her family. Please convince your naana that a woman who has spent her majority of lifetime with him will never take such a step that he envisages. The pleasure that she would experience by being with her family is invaluable and a health booster to your naani. I am critical about the bureacracy which is made of so called human beings but lack human like qualities. What could be the reason that your applications are "still being processed". Are the authorities suspicious of a 78 year old woman. This clearly indicates lack of thoughtful officers though for a moment you could stop thinking of emotions. Your case should be an eye-opener for leaders of both these nations to have some institutional mechanism for free movement of people whose family is distributed between the borders. This should not pose a security problem given the age that those people would have reached by this time. You could have restrictions for people accompanying such old people for security reasons which divisive forces can make use of to create disturbances. Let your grandmother be the messiah of all the people who long to meet their siblings on the other side of the border. The physical seperation (LOC) cannot seperate them from the land they were born in. They should fight for it as their right at the highest level possible. While I try to make the representation of this case in places where I can possibly reach, I sincerely request you to make a strong case of it and reach out to both the people of India and Pakistan. While it made a debut entry in the open edition page, it has all the characteristics to be on the prime page. All the best and see you in India with your naana and naani soon. I read your article 'Stifling the spirit: my naani and 61 years of anguish' today (July 18, 08) in THE HINDU. I could understand the emotional pattern of the writer of the sad saga- That is, you. At times, I wonder what this boundary - LoC - is all about and why mankind is divided so deeply. Man's penchant for an id and clinging on to the same madly has been there ever since he was born. And, this is human nature, they say. Philosophy apart, the delay in processing of papers by the Indian High Commission is only to be expected. Post 1990, the relationship between India and Pakistan literally went to a phase wherefrom reconciliation is next to impossible. I would only be happy if I can be of help to you, given that I am sympathetic to your views. But, mark my words, the day is not far off when these internal conflicts will pave the way for unity amongs all of us - breaking the psychic barriers, in between. After all, we know what happened to the Berlin wall. And, let us all pray to God for that day to be preponed. I read your article 'Stifling the spirit: my nani and 61 years of anguish' published in Hindu today. I read your article that appeared in the 'Hindu' newspaper on July 18, 2008 about your naani. It has taken me nearly 10 days to get over the immense sadness I felt for your naani and for so many others who would be in a similar situation. Even as I type this mail, a surge of sadness engulfs me afresh. What an anguish it must have been to your naani when she had to leave behind everything she was used to and believe in. I pray to God that she gets to meet her family and I am glad your grandfather has given her permission to see her family atleast now. I have been watching with great anguish what is happening in Kashmir. As a human being, I feel very sad. What are the people fighting for and causing damage to the lives of so many?. Life is beautiful and when there is not enough time to love and show affection to people around us, where is the time to hate and damage lives, especially of innocent people. Living in a beautiful and gentle place like Kashmir, how can people get murderous thoughts. Tell your naani that I love her and pray for her. I think all naanis are anyway very sweet. I once again wish you and your family and your naani all the very best in life. I am a human being first and only then an Indian. Your article in The Hindu, in today's edition was quite different experience reading through. I usually glance through the articles, however, completed reading yours. Unlike other articles, this had little ' professional writers' touch, which made the narration looked very practical. It's really saddening to know your efforts are failing till now due to various reasons. However, I happened to read another news in the next few pages, saying there are some talks that's going to happen between Pakistan & India, on opening travel & transport across LoC. My first thought after reading was your family. Hope they come out with some positive decisions. Not taking much of your time & mine, wish you & your grand mom, best of luck. I will be eager to know the proceedings of visa & your travel. Will be even happier to know you three were here. Do let me know when it happens. bye for now & good luck! Your artilcle in The Hindu dated 18-07-2008 had an engaging title and i read it with interest. The real life story of your naani is fascinating.You have written it beautifully. Your anguish, concern, humility, frustration evident throughout, it touched a chord in me. Being a daughter, sister, wife, mother myself I empathise with your maani and her emotionally strife torn life. Your determination and effort to reunite her with her family after so many years is laudable. All I can do as a fellow human being is pray to the supreme being to give you success in your mission and strength and long life to you naani to enjoy the warmth of a family that cares. My best wishes are with you. Hope the maverick political system makes way for human values that bind humanity all over the world. Let us know when your naani meets her family.Hope it will be very soon. That is the reason for your countries to improve Legal Professional colleges. I read the story in the Hindu. May God bless you and bring you success in your mission of great love and noble sentiment. It is indeed heartening to learn that today's generation has such concerns for the elderly. It is something extraordinary.